Two years ago, I wrote a blog post called “Wines for a SoCal autumn” in which I suggested a few seasonal wine themes to pair with the slightly-lower temperatures we get to enjoy this time of year. (Read the piece here.) Over the next few weeks, we’re going to have a series of tastings in which we revisit several of these themes: we’re going to rock the rosé, we’re going to rethink Riesling, and we’re going to discover a better Beaujolais (for the fifth time in our young history). This week, however, we’re going local and popping some bottles hailing from our laid-back neighbor to the north, Santa Barbara. In fact, I took just such a trip a little over a week ago, and the proliferation of delicious bottles I encountered there played no small part in inspiring this meeting. 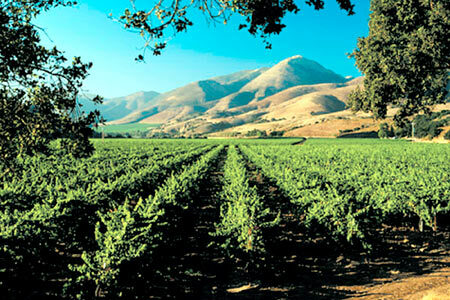 Santa Barbara is perhaps best known for its Pinot Noir, thanks to the 2004 film Sideways which catapulted Pinot (as well as Santa Barbara) into trendy territory. But the ocean-cooled region is also excellent for growing Rhone varieties — Syrah, Grenache, Mourvedre, Carignan, etc. — and the Rhone-style wines resulting from these are some of the most elegant examples to be found in California, typically running a bit less meaty and aggressive than their counterparts from Paso Robles. Santa Barbara also produces a diversity of white wines, from Northern Europe imports (like Riesling and Gewurztraminer) to Rhone-style whites (like Viognier and Grenache Blanc) to California stalwarts (like Sauvignon Blanc and Chardonnay). Your task, imposing at it may sound, is to bring any of these wines that you’d like — so long as it says “Santa Barbara” (or any associated AVA, such as “Santa Maria Valley,” “Santa Ynez Valley,” “Santa Rita Hills,” “Happy Canyon,” “Santa Barbara County,” etc.) on the label. If you don’t have time to grab a bottle before tomorrow’s meeting, don’t stress — I brought plenty of delicious wine back with me from my last trip, difficult as it was to not consume it all on the way home. In the event that you can’t bring a bottle, simply bring $10 to donate to the cause. We’ll be meeting at my place in Sherman Oaks. The RSVP system functions like this: if you want in, you click on this link and tell me so (don’t forget your full name, e-mail address, and a cute message conveying to me your intentions). Once you’ve gotten your confirmation e-mail, go out and find yourself a bottle of Santa Barbara wine… or bring a $10 donation, if you prefer. See you Thursday night at 8pm!